I made a character in west greyside... Hes a scout named Otuel.. I figured I should join a group that would help me learn and this seemed to be the best one. The only problem is that im all the way in west greyside and your all in molebank. Plus im a lvl 1 and molebank is swarming with undead. Can anyone help me? Or give me tips? Don't worry, it's perfect for leveling. If you can reach us, grab as many first aid kits(FAKS) as you can. For one thing, it'll make you extremely useful. For another, 5 xp every time you heal someone other than your scout. Also, freerunning is a darned useful skill to start with. Lets you get into cover and stay there. And don't worry about dying, we maintain a revive point at Hanlon Park(SE Molebank), that's almost constantly reviving people. And that mobile phone is basically the PM function for UD. Useful for contacting members not in the group. 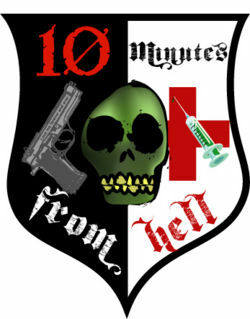 You might want to post in the sticky'd topic labeled "Want to be a member of 10 minutes from hell?" It'll get you, likely enough, onto the "Potential members" list, if you're serious about this. I am serious about this lol. Ill be sure to post there, thanks for the help. Ill make my way to molebank right now.